Beautifully engraved Specimen Certificate from Thompson Products, Inc printed in the 1940's. 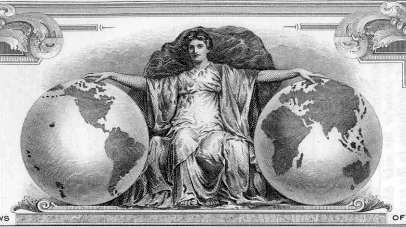 This historic document was printed by the Security Banknote Company and has an ornate border around it with a vignette of an allegorical woman sitting between two globes. This item has the printed signatures of the company's officers and is over 53 years old. This is the first time we have had this certificate for sale. TRW has grown and prospered by using advanced technologies, by creating products and services with maximum value, and by meeting customer needs. Founded in Cleveland in 1901, the company originally developed cap screws and other fasteners. By adapting its cap screw technology to create engine valves for the emerging auto industry, the company gained early competitive advantages in quality and cost management. Soon afterward, TRW's product line included the aircraft engine valves used in Allied fighter planes during World War I. By 1915, TRW was the leading U.S. manufacturer of engine valves, producing the first one-piece valve in 1917 and a highly durable silicon and chrome steel valve in 1921. TRW's experimental hollow sodium-cooled valve helped power the Spirit of St. Louis on Lindbergh's historic solo flight in 1927. The company continued developing its aircraft technology, and by the early 1940s its engine valves and fuel booster pumps enabled the first high-altitude flights. By the mid-1940s, TRW began investing overseas and further diversified its automotive and aircraft businesses. 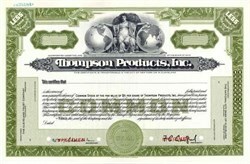 By 1958, Thompson Products entered the growing electronics and defense markets by merging with the Ramo-Wooldridge Corporation in Los Angeles. This merger resulted in Thompson Ramo Wooldridge - today's TRW. TRW has been a national asset in the design and manufacture of unmanned spacecraft for both scientific and defense purposes. TRW's Pioneer 1, the first industry-built satellite, was launched in 1958 as NASA's first step into space. Since then, TRW has built nearly 200 spacecraft. In 1991, TRW began a restructuring program, completed in 1993, to divest non-strategic and under-performing assets and to streamline its core businesses. The program's asset sales generated $475 million, which were primarily used to reduce debt and interest expense. Streamlining actions reduced costs by $90 million. In 1996, the information services businesses were sold for $1.1 billion, and TRW took charges for reconfiguring its businesses and for impaired assets. Litigation, warranty, and employee benefit reserves also were established. In December 1996, TRW announced an alliance with Magna International to design, develop, and produce total vehicle safety systems, and create a joint technical center. TRW eventually acquired all of Magna's steering wheel and air bag businesses. In December 1997, TRW acquired BDM International, Inc., a leader in information systems integration and technology services, for nearly $1 billion. The BDM acquisition expanded the reach and scope of TRW's already strong businesses in space, defense, systems integration, and information technology. In May 1999, TRW completed its $7 billion acquisition of LucasVarity plc. In the automotive markets, these newly acquired businesses position TRW as a global leader in integrated vehicle control systems and modules (which include steering, suspension, anti-lock brakes, traction control, and active vehicle stability) and strengthen the company's positions in occupant safety systems. The technological capabilities and customer base of TRW's aerospace and information systems operations were also enhanced with the addition of LucasVarity's strong aerospace businesses.